I knew some day, for sure, someone would come up with this idea of introducing a Ubuntu (Linux) operating systems for ASUS Eee PC, an ultra-light and mobile laptop, weighing barely 1kg. So, what do we have here? It’s Ubuntu Eee 8.04.1, powered and modded from Ubuntu. From the original version of Ubuntu, the software has been streamlined and compressed to a lightweight operating system, specially meant for ASUS Eee PC. A brand new interface is introduced, following by a couple of fixes and enhanced hardware support. Hence, instead of installing the original version of Ubuntu, the Ubuntu Eee does fantastically well. This release supports various series, such as Eee 701 series, 2G, 900, 901, 1000 and 1000H models. 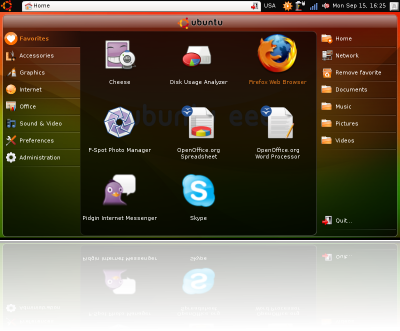 Thus, there is no more worries when you need to install Ubuntu onto your Eee laptops now. This entry was posted on Tuesday, October 7th, 2008 at 5:44 am and is filed under Development Software, Fun Stuff, Linux, Site News, Software Companies . You can follow any responses to this entry through the RSS 2.0 feed. You can leave a response, or trackback from your own site.